Heather Pearson wears many hats as a teacher at Alpha Omega Academy. In addition to teaching history classes, grading student work, and answering questions over the phone, she also teaches geography, psychology, and economics courses. Pearson says her favorite part of being an educator is helping students understand the concepts that they find most difficult. “I love seeing a student make progress, whether it’s in academic understanding or in mastering a new life skill,” she said. 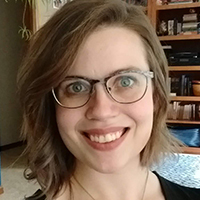 Before arriving at Alpha Omega Academy in the fall of 2016, Pearson earned her undergraduate degree in social studies education from the University of Northwestern – Saint Paul. In the six years between college graduation and her arrival at AOA, she gained experience as a Title I paraprofessional, substitute teacher, summer school instructor, tutor, and high school speech coach. According to Pearson, home and family are the central focus of her life. While she enjoys spending time at home with her two sons, she makes a conscious effort to balance her time between at-home activities and volunteer work within her church and the community. Pearson says her favorite volunteer experience to date has been working at a wildlife rehabilitation center. Other activities that keep Pearson busy include serving as an election judge in her voting precinct and participating in local theater productions and creative art projects when she finds the time. In particular, she likes to crochet, knit, embroider, sew, and make paper crafts. Something most people don’t know about Pearson is that she’s fairly skilled at painting toy soldiers and other miniatures and models, a skill she learned from her father. Before discovering a love for history, Pearson dreamed of becoming a scientist. She envisioned herself becoming a medical lab technician, as she enjoys working independently on detail-oriented projects. If she could meet anyone in the world, Pearson would choose the women who worked at NASA during the 1960s. One of Pearson’s favorite books in the Bible is Psalm 42. She recommends turning to it when you find yourself in need of encouragement.